Note: There are no spoilers for The Lunar Chronicles, although Winter is the fourth and last book in the series. Here is the stunning conclusion to the national bestselling Lunar Chronicles, inspired by Snow White. When Princess Winter was thirteen, the rumor around the Lunar court was that her glamour would soon be even more breathtaking than that of her stepmother, Queen Levana. In a fit of jealousy, Levana disfigured Winter. Four years later, Winter has sworn off the use of her glamour altogether. Despite her scars, Winter’s natural beauty, her grace, and her gentleness are winning admiration from the Lunar people that no amount of mind-control could achieve. Winter despises her stepmother, but has never dreamed of standing up to her. That is, until she realizes that she may be the only one with the power to confront the queen. Can Cinder, Prince Kai, Scarlet, Wolf, Cress, Thorne, Princess Winter, and the palace guard Jacin find their happily ever afters? Fans will LOVE this amazing conclusion to the series. Winter’s release was postponed by many months, leading to lots of sadness all around. As consolation, we received Fairest (#3.5) earlier this year to ease the waiting. Now the question is, was it worth waiting so long for Winter? I say, definitely! For one, it takes a lot of time to write 824 pages. It also takes a very long time to edit these pages to perfection. Prior to Winter, my favourite book in the series was Scarlet (#2), which now ranks as my third favourite book I read in 2015. Winter slightly edged it out and took second place. That shows just how much of an epic conclusion this book is to The Lunar Chronicles. In fact, besides Winter and Scarlet placing in my top 3, Cress (#3) and Fairest both count to my top 20 reads of 2015 thus far. That says a lot for the strength of the entire series. I can’t believe that about a year ago I started Cinder with much trepidation. I didn’t think I’d like it despite (or maybe because of?) the hype. Then I listened to the audiobook and I was sold. Every single book right up to Winter brought me so much joy. The books are innovative in their cross of science fiction and fairytale retellings. It’s one thing to retell a fairytale. It’s quite another to weave in elements of science fiction as cleverly as Marissa Meyer did. My anticipation for Winter was so huge, I refused to place an online pre-order. I knew I would read it the moment I laid my hands on it. Even though I own the ebooks of the other titles in the series, I bought a paperback edition of Winter. As soon as it was available at my local bookstore, I placed a reservation and dashed out of the house to get it. I was elated that it was stocked a few days before the official release date. A lot of things happened in Winter to advance and tie up all the intertwining storylines. Each book in the series carries the title of a newly introduced main character (excluding Fairest since it’s technically a novella). This means Winter was the fourth main character to be cast in the spotlight. Initially I was afraid that four main characters would be too many. I wasn’t concerned so much about keeping track of them but rather, I was afraid that a plot line or two would become too thin to carry on into the series finale. I needn’t have worried. I think that the “airtime” was distributed appropriately, even if I wish I had gotten more of Scarlet. I love Scarlet. She’s my favourite character, so obviously I’m very biased in that aspect. While most of the books I read tend to range from 300 to 400 pages with the occasional 500 odd pages, I didn’t feel that the length of Winter bogged me down in any way. Yes, I read less books in November as a result of the 800 over pages but I didn’t mind in the least. I savoured every single moment, intentionally slowing down on the whole, so that I’d be able to spend more time with this book. Me talking about all the feels rarely happens, if at all. But with regards to Winter, there’s no other way to express my delight. This book gave me all the feels, you guys!!! I cared for every one of the protagonists and their deuteragonists (ie. the most important secondary characters). The entire gang was just splendid and the ships just made me smile. I was surprised that I found myself caring for characters I previously didn’t bother much about. Some bloomed so beautifully and portrayed complexity of the highest order. A couple of them grew and changed so much from the previous books in the series, they brought fresh perspectives to the conclusion of The Lunar Chronicles. 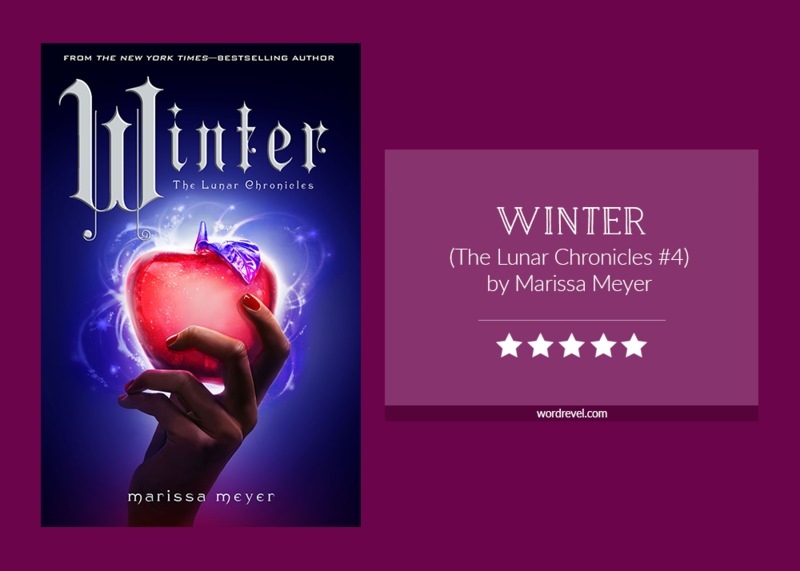 The bottomline of this review: thou must read the greatness that is Winter and The Lunar Chronicles as a whole! Yay!! I’m glad you loved Winter as much as I did!! It was a fantastic book! I want more! Why is it over?! Haha! I just love seeing how you talk about Winter in your post, because you’ve captured the many feelings I had when I was reading it! It’s such an epic, perfect conclusion to this series, and I really think Marissa Meyer did her books and her story justice.